It's no wonder that one of the top reasons people take up running is for weight loss: The sport burns more calories than many other recreational activities. But the rate of calorie burn can vary widely depending on a number of variables. You've probably heard the old adage that a person burns about 100 calories running one mile, but this is just a very loose average that is highly inaccurate for heavier runners, as you'll see below. In this article, we put calorie myths to rest and give you the tools to calculate just how many calories you burn during different types of running workouts. The number of calories you burn while running depends on metabolic variables, like body weight, age and body composition, and performance variables such as pace and incline. Because body composition is difficult to determine accurately, and because age has a relatively low effect on metabolism, most formulas use body weight as the only metabolic variable when calculating calorie expenditure during activity. This Walk/Run Metabolic Calculator on ExRx.net is fun to play around with and more accurate than some other calculators because it factors in the grade (or incline), as well as average pace and the runner's body weight. For weight loss, this calculator is also useful because it allows a runner to view both gross calories and net calories burned. Gross calories are the total number of calories burned in a certain amount of time. Net calories, meanwhile, are the number of calories burned, minus the number of calories you would have burned sitting around doing nothing for the same period of time. Scenario 1: Running 5.0 MPH (12-minute mile) over flat terrain (Grade = 0). A 130-pound person will burn 107 calories per mile. A 155-pound person will burn 128 calories per mile. A 180-pound person will burn 149 calories per mile. A 205-pound person will burn 160 calories per mile. A 230-pound person will burn 190 calories per mile. Scenario 2: Running 5.0 MPH (12-minute mile) over terrain with an average incline of 2.5 percent. A 130-pound person will burn 118 calories per mile. A 155-pound person will burn 141 calories per mile. A 180-pound person will burn 164 calories per mile. A 205-pound person will burn 186 calories per mile. A 230-pound person will burn 209 calories per mile. Scenario 3: Running 7.5 MPH (8-minute mile) over flat terrain (Grade = 0). A 130-pound person will burn 103 calories per mile. A 155-pound person will burn 123 calories per mile. A 180-pound person will burn 143 calories per mile. A 205-pound person will burn 163 calories per mile. A 230-pound person will burn 183 calories per mile. Looking at these results, you might wonder whether the calculator is broken: How can a person possibly burn fewer calories when running faster? Actually, there are two parts to that answer. The first part is that running efficiency improves with speed, as this chart shows. Second, we've calculated calories burned per mile rather than per minute. Scenario 4: Running 7.5 MPH (8-minute mile) for 12 minutes over flat terrain (Grade = 0). A 130-pound person will burn 155 calories total. A 155-pound person will burn 185 calories total. A 180-pound person will burn 215 calories total. A 205-pound person will burn 244 calories total. A 230-pound person will burn 274 calories total. Using this method to determine calories burned is most accurate when you're running at a steady pace over constant terrain, such as on a track or treadmill, or even on a tempo run. But what about when you head out for an interval run, a set of hill repeats or a long, slow run over rolling terrain? You could use the calculator at ExRx.net to figure out the calories burned during each segment of your run, and add the segments to get a total. But since that might be more time and effort than you're willing to put in, the best thing to do is use your average pace for the entire run and leave out the incline, or use a conservative incline estimate if your run was very hilly. This way, you'll err on the side of caution, awarding yourself fewer calories burned rather than more, but you'll still get a fairly decent estimate. 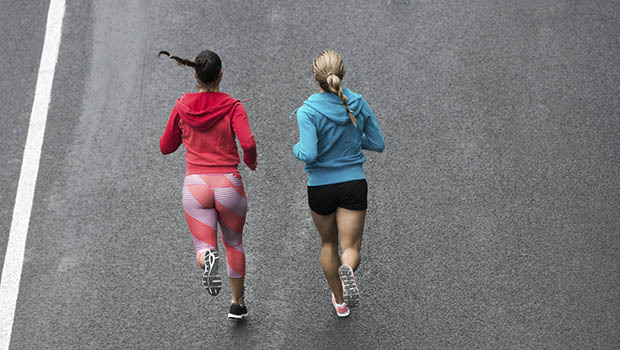 The bottom line is that you'll burn more calories by running faster and/or uphill. For every 0.5 MPH increase in speed or 2.0 percent increase in grade, you'll boost your calorie burn by around 8 percent. Are You Overestimating Calorie Burn?